Bright and warm as it was the other day, we were itching for an outing. An adventure seemed to be in order, and what says excitement better than a cemetery? Queens is known as "the Borough of Jazz" because of the hundreds of working musicians who made their homes here, and Flushing Cemetery could be called "the Necropolis of Jazz" since it is the final resting place for several top players, foremost being the man whose legacy extends beyond jazz to all popular music, Pops himself, Mr. Louis Armstrong. His house – now a museum – is just a few miles away in Corona (an essential and super-fun pilgrimage if you've never been) but we had never visited his monument, so we loaded up the Thermos and set a course for Flushing. 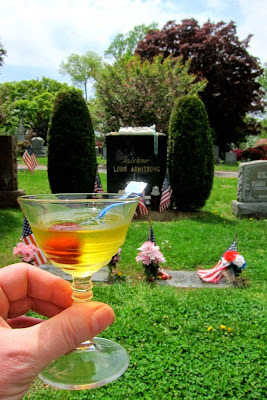 We hustled through the cacophony and congestion of the subway and sidewalks of Main Street, and a short bus ride later were breathing easily in the peaceful leafy luxury of Flushing Cemetery. We found our man resting side by side with his wife Lucille. 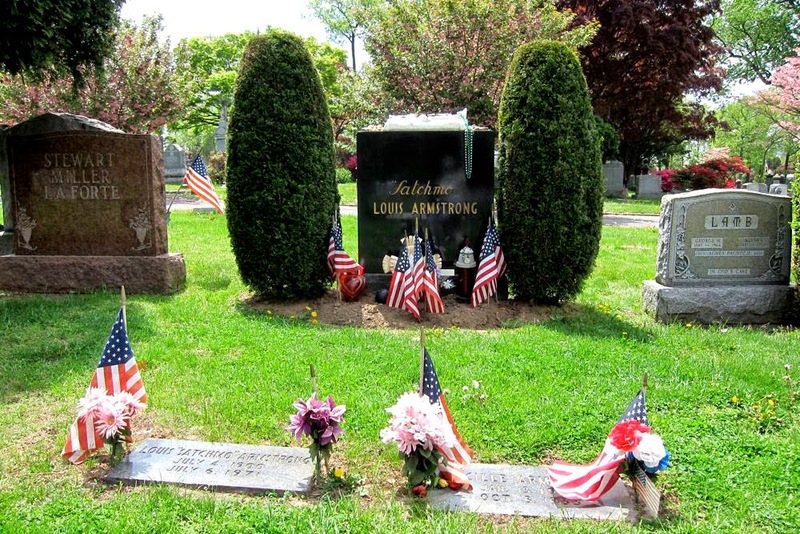 For a guy whose instrumental virtuosity and unique vocal style left music forever changed, Armstrong's headstone is fairly humble, as he was in life. 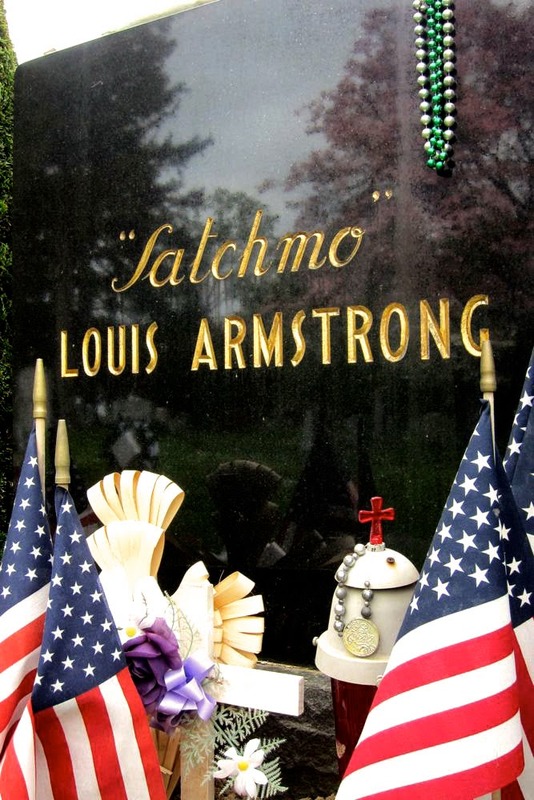 Although he is clearly the person responsible for his own nickname "Satchmo," I've never liked it. Fine for Louis to self-deprecatingly refer to himself as "satchel mouth" (or variations like "dipper mouth" or "real estate jaws") but it's always seemed less than respectful, and sometimes a little creepy, when squares call him Satchmo. Well, it was part of the Armstrong brand, so there it is in gold script. A toast to the preeminent innovator, Louis Armstrong. 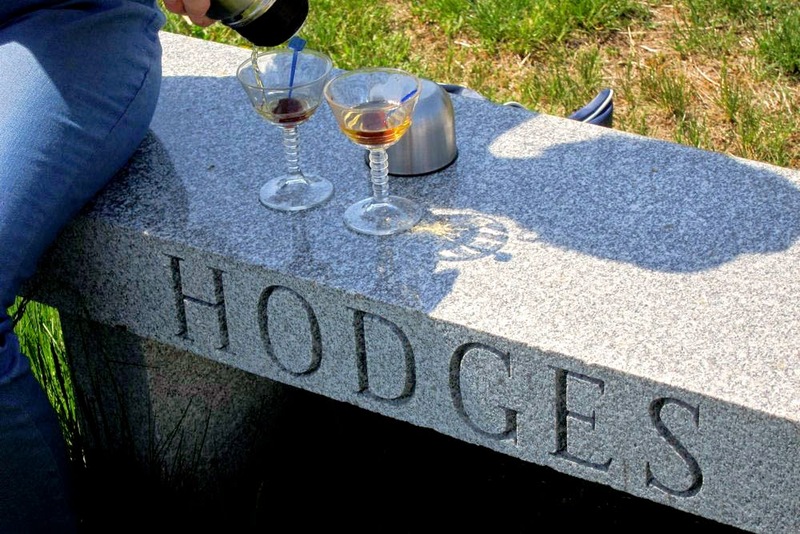 Our next stop was the grave site of the legendary Johnny Hodges, for decades Duke Ellington's lead alto. 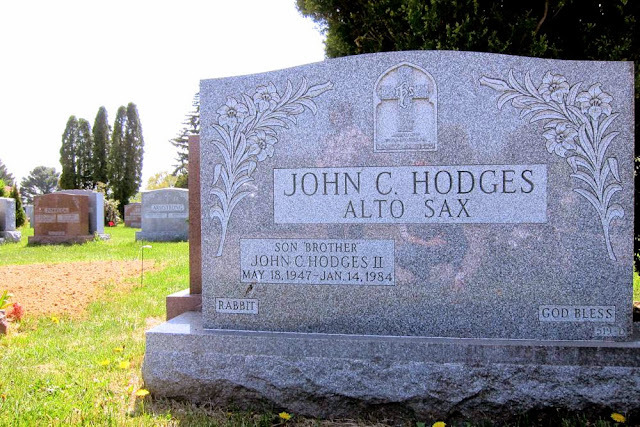 No question that we have the right fellow, because below "John C. Hodges" is helpfully inscribed "Alto Sax" and in one corner "Rabbit," a nickname bestowed by bandmate Harry Carney who was tickled by Hodges' love for lettuce and tomato sandwiches. 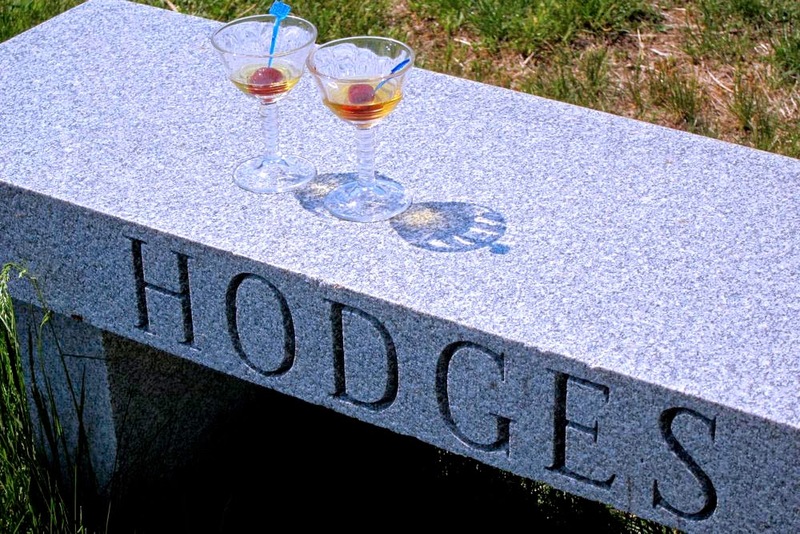 Hodges won the admiration of the best players in jazz for his lyrical solos and "a tone so beautiful it sometimes brought tears to the eyes," as Ellington eulogized at his funeral. But boy, could he blow some blues, too. 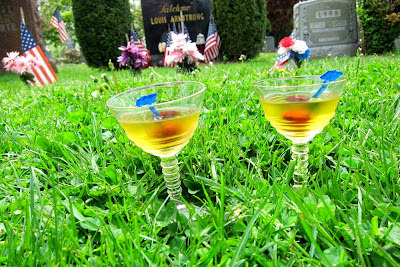 That should be plenty of talent for one graveyard, but this being Queens, there are more big stars in repose. Reportedly, Charlie Shavers, a trumpet player's trumpet player if ever there was one, resides somewhere in Section 31. Pianist and singer Hazel Scott takes five (and more) in Section 9. Woefully, the graves are unmarked. Most surprising, the one trumpet player whose legacy rivals that of Armstrong himself also rests somewhere in Section 31. John Birks "Dizzy" Gillespie, founding father of bebop, outstanding proponent of Afro-Cuban jazz, virtuoso instrumentalist, composer of both serious standards and goofy novelties, and an all around mensch, lies modestly in an unnamed plot. That Gillespie and Armstrong, two men who each created a revolution in jazz music, should find themselves sharing eternity a few hundred yards from one another is a wee bit mind blowing. But that's kooky Queens for you.